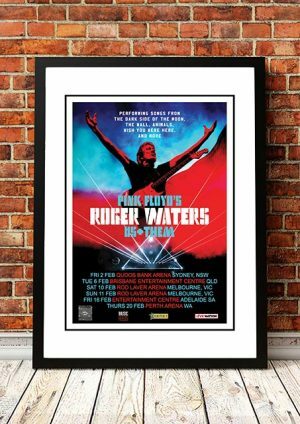 Classic Roger Waters Band Concert Posters and Memorabilia! Buy Online Now! 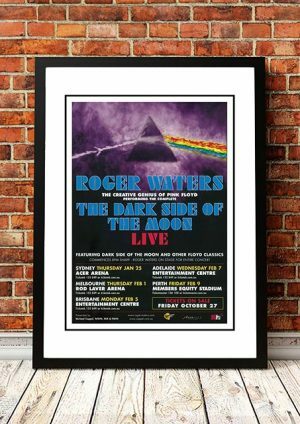 Roger Waters is Pink Floyd‘s grand conceptualist, the driving force behind such albums as Dark Side of the Moon, Wish You Were Here, and The Wall. In the wake of Syd Barrett‘s departure, Waters emerged as a formidable songwriter, but it’s this stretch of ’70s albums — each one nearly symphonic in its reach — that established him as a distinctive, idiosyncratic voice within rock and, following his departure from Floyd in 1985, he continued to create new works in this vein (notably, 1992’s Amused to Death) and capitalized on the enduring popularity of his old band by staging live revivals of Dark Side of the Moon and The Wall in their entireties. We stock some awesome Roger Waters Band Concert Posters.